This fine and precise illustration was on a folded piece of paper that was tucked inside a composition book I came across recently. 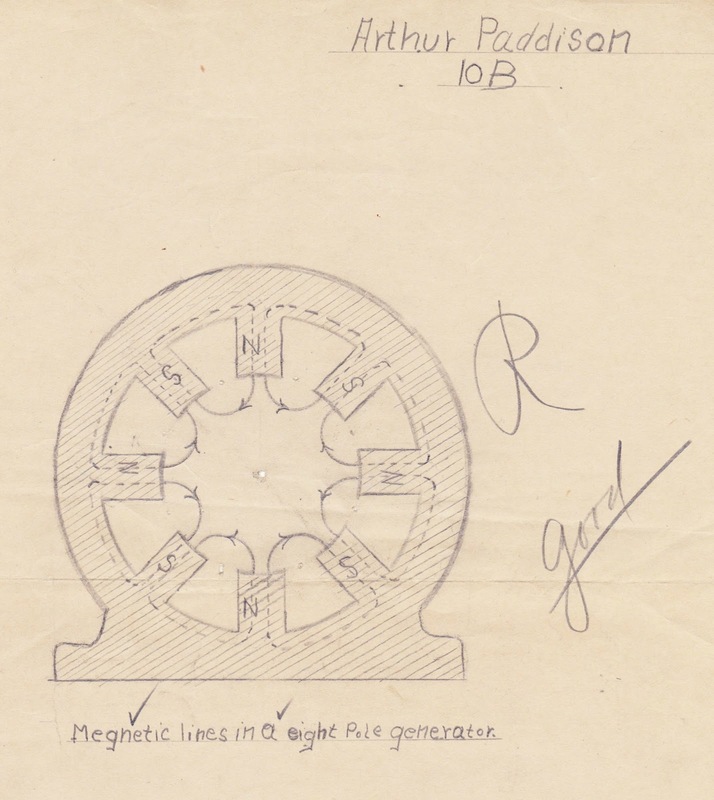 It was done by Arthur Paddison, who labeled it "Megnetic [sic] lines in a eight pole generator." 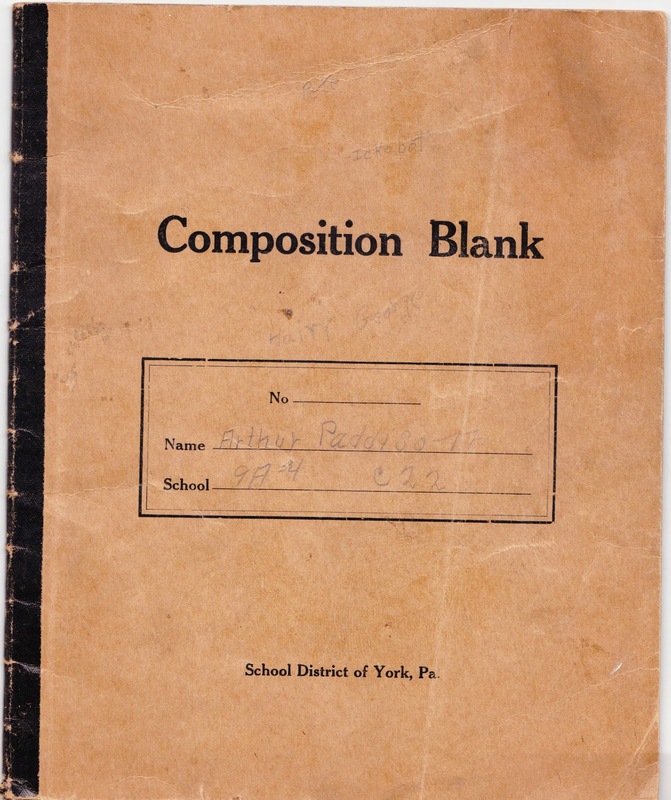 The composition book1 — which is labeled "School District of York, Pa." — is filled with pages of electrical-circuit sketches. The first page starts with two lamps in a series, and it just goes from there with references to double poles, knife switches, snap switches, flush switches and more. Arthur generally received good scores on his sketches. Now, I haven't been able to 100 percent nail down who this Arthur Paddison is. But my best guess is that it's Arthur Henry Paddison. He lived from 1894 to 1983 and died here in York, Pennsylvania. He married Marie Ann Cecelia Brickner in 1914 and they had a daughter that same year. 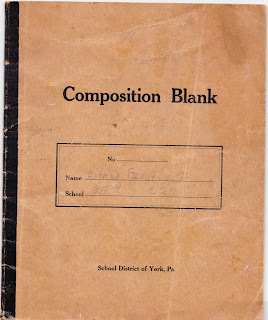 So, if this composition book belonged to the aforementioned Arthur Henry Paddison, then he was taking this 1934-35 class and doing these assignments when he was in his late thirties. Perhaps he had gone back to school to become a certified electrician? The idea that Arthur was about 40 when he drew these sketches does make some sense. The contents of the composition book are precise and no-nonsense. (Alas, no doodling.) The printing, to me, seems more like that of an adult than a student, with its idiosyncrasies. And he has some spelling issues — megnetic, paralel, controled — that you would probably not see from a high school or college student who was otherwise doing this level of quality work. 1. The name Arthur Paddison is written on the cover in pencil. There are also a few other very faint words written in pencil on the cover — Pete, Ickabot (or Ickobot) and Hairy George. I wonder if anyone on Preserving York would recognize the name? EndoPest and EndoWeed make gardening MORE FUN!